Head coach Mike Ford says Bath must start believing they can win important games after reaching the Amlin Challenge Cup final. Sunday's 24-18 win over London Wasps ended the Rec outfit's six-year wait to reach a cup final. They also have a crucial match against Northampton approaching in the race for a Premiership play-off spot. The last time Bath reached the Challenge Cup final was in 2008 when they beat Worcester to lift the trophy. "We've got to get belief with us so people say 'Bath are a big team, they can win the big games'," said Ford. "You look at what Leicester have done over the past 10 years and everyone talks about Leicester coming good now. "I don't believe they've actually played that well. But it's perception." Reigning Premiership champions Leicester have dominated the modern era of domestic rugby, winning eight titles in the past 15 years. 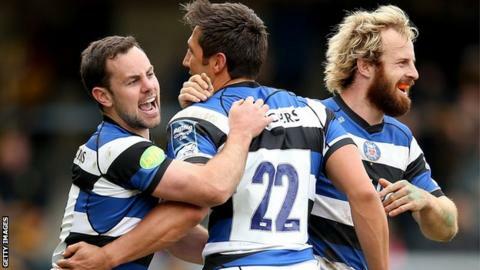 Bath are third in the table and level on points with the Tigers, whom they beat at the start of the season. Ford's side can still sneak a home tie in the play-offs, but will need to beat second-placed Northampton on Friday to do it. Bath will meet Saints in the Challenge Cup final at Cardiff Arms Park on 23 May and could well encounter each other again in the play-offs. Ford's side have struggled against the Premiership's top two this term though, losing to leaders Saracens twice and Saints once. "We need to start winning big games. This win against Wasps will give us belief against Northampton," added Ford. "We need to beat a big side. After losing to Saracens twice this season and Northampton once, the next layer of belief is beating Northampton. "The more we can win these games, the more those doubts will go."